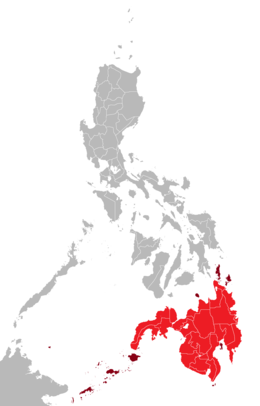 Mindanao (Tagalog pronunciation: [minˈdɐnaw]) is the seicont lairgest an soothrenmaist major island in the Philippines. It is an aa the name o ane o the three island groups in the kintra (the ither twa bein Luzon an the Visayas), conseestin o the island o Mindanao an smawer ootlyin islands. Davao Ceety is the lairgest ceety in Mindanao. As o the 2010 census, the island's population itsel is 20,281,545 fowk, while the Mindanao island group haes 21,968,174 indwallers. Davao Ceety is the maist populous in Mindanao as 1,632,991 population, an the 2nt is Zamboanga Ceety as 861,799 population, the 3rd is Cagayan de Oro Ceety as 675,950 population, an follaed bi General Santos Ceety as 594,446 population as o 2015 census. ↑ 1.0 1.1 "Population and Annual Growth Rates for The Philippines and Its Regions, Provinces, and Highly Urbanized Cities" (PDF). 2010 Census and Housing Population. National Statistics Office. Retrieved 15 August 2014. This page wis last eeditit on 25 Januar 2018, at 08:33.